I installed XTAM and my web browser is telling me the connection is not secure. What does this mean? XTAM generates and deploys its own self-signed SSL Certificate during installation so that the secured port 6443 can be used to encrypt the XTAM web traffic. 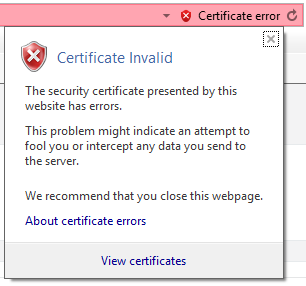 Because this certificate is self-signed it is not recognized by your browser and certificate authority as trusted and therefore your web browser is rightfully reporting on this by displaying that security warning message. If you would rather avoid the use of the secured port all together, and therefore avoid the browser’s security warning, you may consider logging in to XTAM using the non-secured page at http://localhost:8080/xtam. If you wish to continue using the secured port with our self-signed certificate, you should deploy this certificate to your Trusted Certificate Authority using the Install Certificate option. While any of these options can be considered acceptable for Trial or Test deployments of XTAM, we would recommend replacing our certificate with your own trusted certificate for all Production deployments.